Discover how to improve your mental game—the next frontier in sports training—no matter your age or experience and become the Playmaker or the decisive general on the court or field. Coaches search for it. Parents dream of it. Fans love it. Athletes want it. The Playmaker on any sports team possesses it: an elusive, intangible quality combining anticipation, perception, and decision-making skills. This quality raises their game above the competition and allows them to pass when no one else can, anticipate the movement of opponents, and avoid costly mental mistakes, thus holding the team together. Using today’s technology and tools, it is now possible to understand, assess, and train this sixth sense rather than just hope it magically appears. Now, for the first time, cognitive science research is revealing the secrets of the Playmaker’s keen sense of awareness. Just as tests of speed, strength, and agility have provided a baseline of physiological biomarkers, coaches can now capture cognitive metrics including attention, pattern recognition, anticipation, and the ability to take quick, decisive action during the chaos of competition. The Playmaker’s Advantage is a groundbreaking book that will educate athletes of all ages about this essential creative capability in an accessible, easy to understand method. Leonard Zaichkowsky, a professor, researcher, and consultant for almost four decades at Boston University, pioneered sports psychology by bringing cognitive neuroscience and sports performance together as an interdisciplinary science. His academic textbooks and research publications demonstrated the importance of an athlete’s remarkable brain in anticipating and acting on opportunities during competition. He has consulted with teams in the NBA, NHL, NFL, MLB, Australian Rules Football, the Spanish men’s national soccer team, and Olympic sports organizations around the world. Len is a former president and a fellow of the Association for Applied Sport Psychology, a member of the editorial board of the Journal of Applied Sport Psychology, and currently section editor on psychology for the International Journal of Health, Sport and Science. Recently, the American Psychological Association honored Len with the “Distinguished Service to the Profession” award. Today, Len is a cofounder and senior consultant at 80 Percent Mental Consulting, advising coaches, teams, and sports organizations on developing athlete cognition. After too many Boston winters, he and his wife now live in Fort Myers, Florida. Daniel Peterson is a writer and consultant specializing at the intersection of neuroscience and sports performance. He combined twenty-five years of technology management experience with his second life as a sports dad and coach to explore how athletes make decisions. Now, ten years later, as cofounder and director of 80 Percent Mental Consulting, he works with coaches, trainers, and teams to understand and improve their cognitive game. Dan and his wife live outside of Milwaukee, Wisconsin, patiently waiting for the next generation of Peterson playmakers. "One of the most valuable books I have read in a long time. How often as coaches have we said it is all in your head. 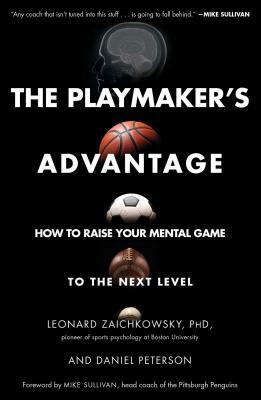 The Playmaker's Advantage shows how to use what’s in our head to our competitive advantage."